I bet many of you won’t understand this blog entry. And I bet many of you will say you understand, but in fact, you really don’t. You just think you do. Unless you have walked the exact same journey as someone else, you don’t really understand. You can try to empathise, sympathise, have compassion, but you don’t really GET IT. Yesterday I got two bits of news that left me in terrible form last night. Today, I’m left angry at the systems which have created these issues. These issues, which I will address below, now leave me with an even more pronounced inability to plan for the near future. And forget about the distant future, I can’t emotionally afford to let myself go there. So, yesterday morning I had a very productive meeting with Brendan Bjorn’s new disability team here in Co. Louth and with the previous one in Co. Kildare to assure a smooth transition of care. That is the gold standard for continuity of care and I’m truly appreciative to both teams for making it happen. I’m very impressed with the Co. Louth team – they have been nothing but proactive, attentive and in tune with Brendan’s high level of needs. This, though, leads me to the troubling issue resulting from that meeting: Upon seeing that I cannot use the hoist to get Brendan from his bed to the wet room for a shower, it left the team with the conclusion that either the council needs to provide us with a completely disability suitable permanent home, or this home needs re-modified. Of course, the latter point is basically moot considering this is a privately owned rental home. So, unless the council wants to buy it and the owner wants to sell it, forget that idea. Now what do I do about the housing situation…again? 1. The appointment for the sleep study coming up in 10 days is NOT guaranteed to happen. 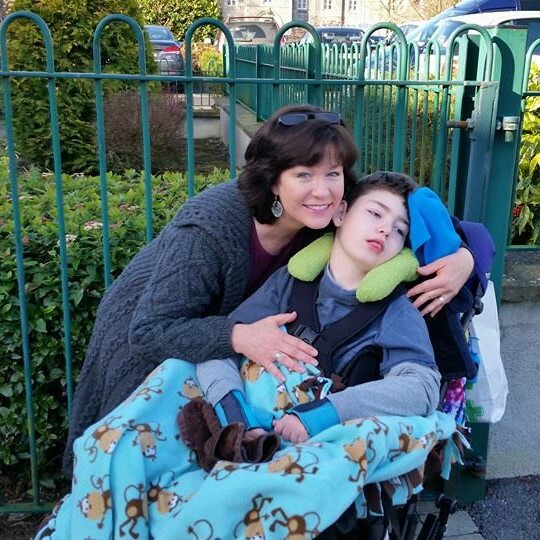 If they need the bed for another child, Brendan will lose his bed and that study will have to be rescheduled. Again. 2. They will ring me that day between 12 – 2pm to let me know if there is a bed available. It’s a Monday. Declan will be in school. I have no one to take care of him so it will mean I remove him from school on the fly as I load up Brendan to drive down to Crumlin from Dundalk. 3. There will only be an aide to sit with Brendan during the night, not during the day, and they require me to be there anyway to answer all the questions that will arise. This means Declan will have to miss school Tuesday as well. And it means we just as well not bother to drive the 90 minutes home for the night and then back down early the next morning and will find a place to stay in Dublin for the night. 5. The 4:30pm MRI might not even take place, depending on how busy the department gets during the day. This would mean A) staying another night inpatient IF there is a bed, and B) Declan missing yet another day of school on Wednesday, that is IF the MRI were rescheduled for the next day. And let’s never mind the pets back at home in all this uncertainty. Unless you are a lone parent with absolutely no family to help mind your other child, you don’t understand the amount of stress that that lack of a support brings as you try, alone, to juggle both of your children’s very pressing needs. Unless you are the parent of a severely disabled child with profound care needs, you don’t understand the sheer frustration in dealing with a clearly long broken healthcare system that doesn’t have a clue what it’s like to be the parent of such a child. Unless you are at the mercy of the greed-driven housing market brought on by those with no compassion for families like mine, then you can’t understand the insecurity felt to my very core as I struggle emotionally knowing that I cannot provide the suitable, life-long home which is required for both of my sons.